The Birthday call is designed to call your friends and family and play a Happy Birthday greeting to them from you! The Standard Birthday Call is free if scheduled two weeks in advance. It's Easy! Just click below and enter your First Name, E-mail Address and a Password...That's it! 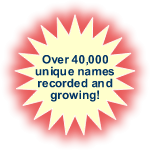 We currently have over 40,251 names in our sound files which allows us to personalize each and every Birthday Call. This means that when a person receives a birthday call from you, we will include your name, their name and your relationship to that person. ©2008-2011 TheBirthdayCall.com. All Rights Reserved.